The idea of a Geographical zone was first hypothesized by the ancient Greek scholar Aristotle in an attempt to classify the world's climatic zones. He determined three types of climatic zones based upon location in relation to the equator. While his mapping was oversimplified due to limited geographical knowledge available at the time, his general understanding was correct. As knowledge of the earth's geography improved, the geographical zones increased to five, based upon each of five main latitude regions divided by the major circles of latitude. Today, there are several climate classifications systems used, the four most common being: The Köppen climate classification; Trewartha climate classification scheme (based upon the Koppen); the Aridity index; and the Holdridge life zones system. However, climate classification is a multidimensional concept, considering many environmental variables. While no classification system is absolute, they play a key role in discerning the geographic distribution and interactions of existing climatic elements. Individually and together they provide important data for climate awareness. They serve as educational tools for understanding climate in the world's most distant regions. These circles of latitude (excluding the equator) mark the divisions between the five principal geographical zones. Arcs of circles of latitude are sometimes used as boundaries between countries or regions where distinctive natural borders are lacking (such as in deserts), or when an artificial border is drawn as a "line on a map," as happened in Korea. Map of annual average temperatures as a function of location. In the Torrid Zone, also known as the Tropics, the sun is directly overhead at least once during the year—at the edges of the tropics this occurs at the summer solstice, and over the equator, at the equinoxes. This is the hottest part of the earth, and there are two annual seasons: a dry and a wet. The Torrid Zone includes most of Africa, southern India, southern Asia, Indonesia, New Guinea, northern Australia, southern Mexico, Central America, and northern South America. In the two Temperate Zones, the sun is never directly overhead, and the climate is mild, generally ranging from warm to cool. The four annual seasons, Spring, Summer, Autumn and Winter occur in these areas. 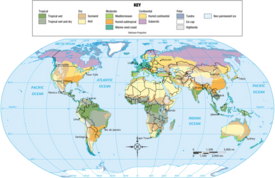 The North Temperate Zone includes Great Britain, Europe, northern Asia, North America, and northern Mexico. The South Temperate Zone includes southern Australia, New Zealand, southern South America, and South Africa. The edges of the Temperate Zones are also sometimes referred to as the Subtropics, Subarctic, and Subantarctic. The two Frigid Zones, or polar regions, experience the midnight sun and the polar night for part of the year—the edge of the zone experiences one day at the solstice when the sun doesn't rise or set for 24 hours, while in the center of the zone (the pole), the day is literally one year long, with six months of daylight and six months of night. The Frigid Zones are the coldest parts of the earth, and are covered with ice and snow. The North Frigid Zone (the Arctic) includes northern Canada and Alaska, Greenland, northern Scandinavia, northern Russia, and the Arctic ice. The South Frigid Zone (The Antarctic) is filled by the continent of Antarctica; the next closest mainland is the southern tip of Chile and Argentina, followed by New Zealand. While both the North and South Poles are in frigid zones, there is a vast difference in temperature between the two. The North Pole lies at sea level in the middle of the Arctic Ocean, which acts as a reservoir of heat.The sea ice at the North Pole is typically around two or three meters thick, though there is considerable variation and occasionally the movement of floes exposes clear water. The South Pole sits atop a featureless, windswept, icy plateau at an altitude of 9,306 feet (2,836 m), about 8,000 miles (13,000 km) from the nearest sea at McMurdo Sound. The ice is estimated to be about 9,000 feet (2,700 m) thick at the Pole. Winter temperatures at the North Pole can range from about −45ºF (−43°C) to −15°F (−26°C), perhaps averaging around −30ºF (−34°C). Summer temperatures (June, July and August) average around the freezing point (0°C, 32°F). In comparison, the winter temperature at the South Pole remains steady at around −85°F (−65°C). The highest temperature ever recorded at the Amundsen-Scott South Pole Station is 7.5°F (−13.6°C), and the lowest is −117.0°F (−82.8°C). The idea of a geographical zone was first hypothesized by the ancient Greek scholar Aristotle. He said that the earth was divided into three types of climatic zones, based on their distance from the equator. Thinking that the area near the equator was too hot for habitation, Aristotle dubbed the region around the equator (from 23.5° N to 23.5° S) as the "Torrid Zone." He reasoned that from the Arctic Circle to the pole was permanently frozen. He called this uninhabitable zone the "Frigid Zone." The only area that Aristotle believed was livable was the "Temperate Zone," lying between the "Frigid Zone" and the "Torrid Zone." One of the reasons Aristotle believed that the Temperate Zone was the best for life possibly stems from the fact that he lived in that zone. As knowledge of the earth's geography improved, a second "Temperate Zone" was discovered south of the equator, and a second "Frigid Zone" was discovered around the Antarctic. It is understood today that Aristotle's map was vastly oversimplified, although the general idea was correct. Holdridge life zone classification scheme. Although conceived as three-dimensional by its originator, is usually shown as a two-dimensional array of hexagons in a triangular frame. Climate classification systems are ways of classifying the world's climates. A classification may correlate closely with a biome category, as climate is a major influence on biological life in a region. The most commonly used climate map is the Köppen climate classification scheme. Others in use are the Aridity index and the Holdridge Life Zone Classification System. The Köppen climate classification, developed by German climatologist and amateur botanist Wladimir Köppen (1846-1940) is based on the concept that native vegetation is the best expression of climate; thus, climate zone boundaries were selected with vegetation distribution in mind. The system combines average annual and monthly temperatures and precipitation, and the seasonality of precipitation. 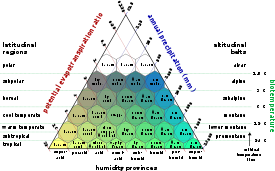 The Köppen climate classification scheme divides the climates into five main groups and several types and subtypes. The Köppen classification includes climate regimes such as rainforest, monsoon, tropical savanna, humid subtropical, humid continental, oceanic climate, Mediterranean climate, continental steppe, subarctic climate, tundra, polar ice cap, and desert. The Köppen system, however, has its drawbacks. A modified version of the Köppen system known as the Trewartha climate classification scheme attempts to redefine the broad climatic groups in such a way as to be closer to vegetational zoning, especially in the United States. Under the standard Köppen system western Washington and Oregon are classed into the same climate as southern California, even though the two regions have strikingly different vegetation. It also classes southern New England into the same climate as the Gulf Coast. Trewartha's modifications sought to reclassify the Pacific Northwest seaboard as a different climate from California, and New England from the Gulf Coast. The Holdridge life zones system is a global bioclimatic scheme for the classification of land areas. It was first published by Leslie Holdridge in 1947, and updated in 1967. It is a relatively simple system based on few empirical data, giving objective mapping criteria. A basic assumption of the system is that both soil and climax vegetation can be mapped once climate is known. While it was first designed for tropical and subtropical area, the system applies globally. The system has been shown to fit tropical vegetation zones, Mediterranean zones, and boreal zones, but is less applicable to cold oceanic or cold arid climates where moisture becomes the determining factor. The system has found a major use in assessing the possible changes in natural vegetation patterns due to global warming. ↑ Brian Handwerk, November 8, 2004, Beyond "Polar Express": Fast Facts on the Real North Pole National Geographic News. Retrieved January 23, 2009. ↑ John L. Daly, The Top of the World: Is the North Pole Turning to Water? Still Waiting for Greenhouse. Retrieved January 23, 2009. ↑ National Science Foundation, Office of Polar Programs, Amundsen-Scott South Pole Station. Retrieved August 22, 2007. ↑ James Foster, Science question of the week, Goddard Space Flight Center. Retrieved January 23, 2009. ↑ National Science Foundation Office of Polar Programs, Your stay at Amundsen-Scott South Pole Station. Retrieved January 23, 2009. Akin, Wallace E. 1991. Global Patterns: Climate, Vegetation, and Soils. Norman: University of Oklahoma Press. ISBN 9780806123097. Aquado, Edward and James Burt. 2006. Understanding Weather and Climate, 4th ed. Upper Saddle River, NJ: Pearson Prentice Hall. ISBN 0131496964. Brummitt, R.K. August. 2001. World Geographical Scheme for Recording Plant Distributions. Hunt Institute for Botanical Documentation, Carnegie Mellon University. Retrieved January 6, 2009. Frodin, David G. 2001. Guide to the Standard Floras of the World. Cambridge: CUP. ISBN 9780521790772. Harris, Stuart A. 1973. Comments on the Application of the Holdridge System for Classification of World Life Zones as Applied to Costa Rica. University of Colorado. Retrieved January 6, 2009. Leemans, Rik. 1990. Possible Changes in Natural Vegetation Patterns Due to a Global Warming. National Geophysical Data Center. Retrieved January 6, 2009. Lugo, Ariel E., Sandra L. Brown, Rusty Dodson, Tom S. Smith, and Hank H. Shugart. 1999. The Holdridge Life Zones of the conterminous United States in relation to ecosystem mapping. US Environmental Protection Agency, Western Ecology Division. Retrieved January 6, 2009. McKnight, Tom L. 1984. Physical Geography: A Landscape Appreciation. Englewood Cliffs, NJ: Prentice-Hall. ISBN 9780136691013. Times Books (New York, N.Y.), and Bartholomew (Firm). 1999. The Times Atlas of the World. New York: Times Books. ISBN 9780812932652. This page was last modified on 25 January 2009, at 15:20.